Welcome to the sixteenth edition of the Scorpio Partnership Global Private Banking Benchmark. Following the success of our previous comprehensive reports, we continue our investigation into the impact of changing market trends on the global wealth industry. This resource has been prepared for public consumption every year since 2001 by Scorpio Partnership, the world’s leading strategy R&D think tank specialised exclusively on wealth management and private banking. The report provides a detailed industry analysis on key performance indicators (KPIs) based on results collated from over 200 private banks and subsidiaries around the world. The firms assessed manage a total of USD16.9 trillion of client assets. The industry as a whole manages, the report estimates, USD21.1 trillion. This research program evaluates effectively 80% of the entire industry and it covers all of the major operators. This makes it the most comprehensive objective assessment available. The report is compiled by an experienced team of consultants and analysts who are constantly engaged with the international private banking and wealth management market. The report itself includes analysis of circa 20,000 data points on the private banking industry’s key performance indicators. The Private Banking Benchmark 2017 is therefore essential reading for private banking management, private banking strategy teams and financial analysts as well as service providers to the private banking market including asset managers, investment banks, trust companies and specialist professionals such as lawyers, accountants and management consultants. The report is available for purchase directly from Scorpio Partnership. For more information please contact valeriya@scorpiopartnership.com. Our leading assessment of KPIs in wealth management highlighted that private banks successfully navigated regulatory and political upheaval in 2016, with assets under management rising by almost 4% on average. 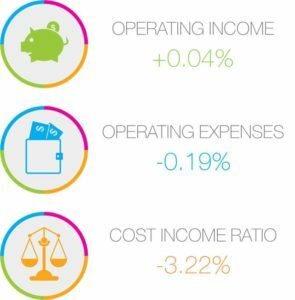 Cost income ratios also fell below 80% for the first time since 2012, reflecting wealth managers concerted efforts to cut costs despite continued compliance pressures. Strong profitability growth masked the industry’s underlying struggle to improve revenues, with operating income rising just 0.04% on average. “As advanced technology continues to reshape the wealth management industry, firms will be able to recognise cost savings through process optimisation,” said Caroline Burkart, Director at Scorpio Partnership. “The challenge going forward will be managing the revenue side of the profits equation. These firms are experiencing pricing pressure, driven by regulations, the trend for passive investing and the wave of lower-fee competitor models entering the market. Solving the equation will require increased focus on enhancing the proposition with advisory capabilities and improvements to the client experience,” she added. This year the largest 25 firms in the Benchmark managed USD13.3 trillion of HNW AUM, representing a 63.2% market share. Of the top ten operators, seven had a North American focus. However, Asia’s private banks gained momentum in 2016. 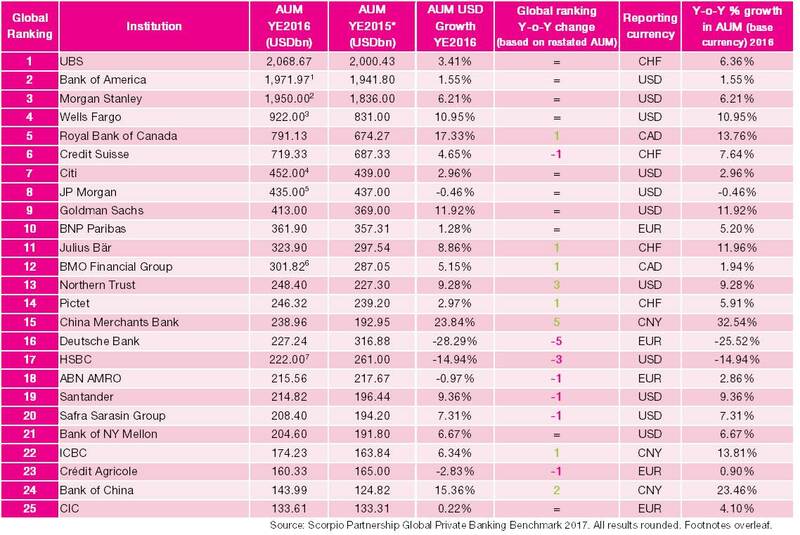 China Merchants Bank stands out in the ranking, having added over CNY400bn to AUM in 2016 as a result of enhanced customer acquisition efforts, as well as upgrading it’s private banking proposition. Another contender from Asia, Bank of China, entered the ranking this year, managing over CNY1 trillion on behalf of its wealth management and private banking customers. By contrast, many of Europe’s key operators experienced negative AUM growth due to a combination of internal restructuring initiatives, decisions to scale back from non-core markets and reputational challenges. Note 1: AUM YE2015 figures have been restated to adjust for changing methods in financial reporting by private banks and in some cases are not consistent with previous years’ press releases. Note 2: Benchmark AUM data aims to represent actively managed assets of private clients who hold more than USD1 million (or the local currency equivalent) with the firm. We note that not all firms conform to this reporting methodology. 1Bank of America Merrill Lynch’s Global Wealth and Investment Management division AUM includes Merrill Lynch Global Wealth Management (MLGWM) and US Trust, Bank of America Private Wealth Management & Other. The firm reports total client balances of USD2,508.6bn including USD886.2bn in AUM and USD1,085.8bn of brokerage business for this division. Assets in custody of USD123.1bn are excluded, as well as banking deposits of USD262.5bn and loans and leases of USD151.0bn for this client segment. 2Morgan Stanley AUM figure of USD1,950.0bn represents Wealth Management Client assets net of Deposits of USD153.0bn. 3Wells Fargo AUM includes client investment assets of Wells Fargo Wealth Management and HNW assets of Retail Brokerage business. 4Citi’s AUM is for accounts over USD1 million including Citi Private Bank assets (CPB targets clients with a net worth of USD25mn) and Citi Personal Wealth Management assets (CPWM targets mass affluent clients). In 2016, Citi Global Consumer Business exited a number of countries, particularly in Latin America. 5JP Morgan’s AUM of USD435.0bn only refers to assets actively managed on behalf of Private Banking clients and does not include Brokerage and Deposit assets. The addition of custody, brokerage administration and deposit accounts would give total private banking client assets of USD1,098.0bn. 6BMO Financial Group AUM refers to BMO Wealth Management division. 7HSBC AUM figure relates to funds under management placed with HSBC Global Private Banking division that serves high-net-worth individuals and families. HSBC GPB total Client Assets (funds under management plus customer deposits) are USD298bn. There are two purchasing options depending on the usage requirements for the report. 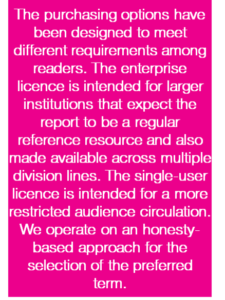 1.The Single-user licence is intended to accommodate a smaller user group of reviewers and focuses on the charts of primary KPIs. 2.The Enterprise licence out includes extended data tables of NNM, cost income ratios and profits for the leading top 50 firms. This is also intended for a wider internal distribution and the document can, for instance, then be placed on a corporate server archive.